Posted on Sun, Mar 18, 2012 : 10:14 p.m.
Want to find a silver lining in this NCAA tournament for the Michigan basketball team? Its strength of schedule is going to shoot through the roof. Ohio, which upset the No. 4-seeded Wolverines 65-60 on Friday night, became one of the mid-major darlings of this March Madness by beating South Florida, 62-56, on Sunday. All but two of the 16 teams in the regional semifinals will be from power conferences. The lone exceptions are Ohio and Xavier. The Bobcats join a group of four Big Ten teams to advance to the Sweet 16. Coach John Groce, right, and the Ohio bench celebrate in the final moments of the team's 62-56 win over South Florida in a third-round NCAA tournament game Sunday in Nashville, Tenn.
Michigan State, Ohio State, Indiana and Wisconsin advanced while No. 10 seed Purdue nearly missed on an upset bid to join them, losing 63-60 to No. 2 seed Kansas on Sunday night. After Kansas took a three-point lead with 2.5 seconds left, Purdue sharpshooter Ryne Smith managed to get off a decent look at a long, potential tying 3-pointer. It hit off the backboard, clanked off the rim and finally fell away. "It stinks," Purdue coach Matt Painter said. "It stinks to lose." The No. 13-seeded Bobcats (29-7) will play No. 1 seed North Carolina in St. Louis on Friday in their first trip to the round of 16 since they lost to Michigan in the regional finals in 1964. 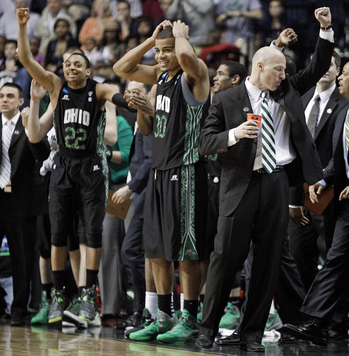 "I do think our guys have a chip on their shoulder," said Ohio coach John Groce. "I think our guys look forward to playing on the big stage against quality competition." Ohio trailed by two when Walter Offutt (21 points) swished a 3-pointer, launching a 10-0 run for the Bobcats. A pair of free throws by D.J. Cooper (19 points) made it 54-46 with 3:28 left. The Bobcats had a 59-53 lead when Toarlyn Fitzpatrick connected for South Florida's first 3-pointer of the half. But Cooper went 3 for 4 from the line while the Bulls missed three shots in the final 36 seconds. "This is amazing," Offutt said. "It's one thing to talk about it and one thing to actually do it. This has been unreal, but let's just continue the run." According to STATS, this will be the first time since 2003 that 14 teams from the six major conferences have made the Sweet 16. The Big Ten will make up one-quarter of those teams. The conference's other representatives advanced on Saturday. Ohio State beat Gonzaga, 73-66; Indiana topped VCU, 63-61; and Wisconsin eliminated Vanderbilt, 60-57. Mon, Mar 19, 2012 : 4:26 a.m.
25% of the Sweet 16 is from Ohio. Mon, Mar 19, 2012 : 3:56 a.m. Pride before the fall !!! Mon, Mar 19, 2012 : 3:30 a.m.
Once Beilien choked away this opportunity we really do not care about the bobcats or the buc nuts. Just worry about our hockey and softball teams. They have coaches that know what they are doing. By the way are we going to have to read all about the Oklahoma women for the rest of the tournament? I hope not, but an article about Brandon looking for new BB coaches would be great! Mon, Mar 19, 2012 : 3:22 a.m. Funny how many times everyone will have to hear about the 'silver lining' in the tournament for the Wolverines instead of them just beating their opponent. Although, if it's still confusing for Brady Hoke and John Beilein, just say 'THE OHIOS' are in the Sweet 16. We'll all understand. Poetic justice. Glad to see the B1G represented by 4 quality teams. Mon, Mar 19, 2012 : 3:16 a.m. So does this mean if Ohio somehow gets to the Final Four and plays MSU that UM fans will be rooting for a Ohio team to beat a team from Michigan again? some silver lining.